Please note that the manufacturers will be switching the MTX and Viper shoes from Leather to Vinyl. These changes will be effective starting May, 2018. They will continue to ship these shoes out in the leather option until inventory is depleted, then they will begin to send the vinyl shoes. The vinyl is just as durable, if not more, than the leather shoes! The look and feel is the same as before! The Viper from Director’s Showcase International is the only shoe of its kind. 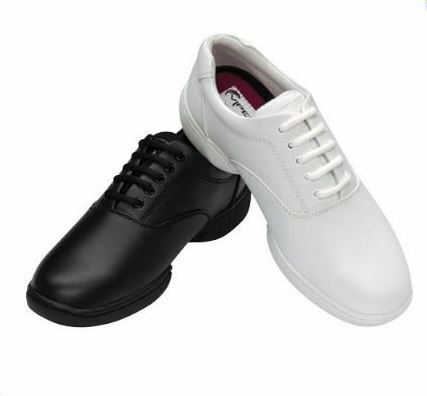 Its twin sole design is specifically suited for marching band, guard and percussion performances. Whether you’re on asphalt, grass or the gym floor, the Viper provides exceptional support and flexibility. This item usually ships with 48 hours. Standard shipping takes approximately 2-5 business days. Viper Marching Shoe from DSI on Vimeo.